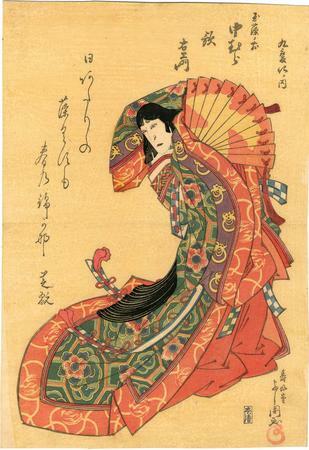 Nakamura Utaemon III (1778-1838) as Tamamo no Mae in the play Yosete Aratama Kokonobake, performed at the Kado Theater in 1/1825. Utaemon opened 1825 with a two-part performance. The first part was a New Year's keisei play; the second, a grand finale consisting of a set of nine changes, which Yoshikuni depicted in a nine-print yellow-ground set. The story of the fox-witch, Tamamo no Mae, is central to a number of different tales and plays and makes an excellent and dramatic short dance piece. For an illustration see Schwaab, Osaka Prints, cat #74, page 106. A superb and sublimely elegant Osaka design. No one knows for sure if the origin of the 9-tailed fox is Chinese or not. However, there are parallels to this myth in both Japan and China and elsewhere in the Far East and in India. For example, during the Chou dynasty a woman, named Hua Yang, was added to harem of the emperor. In time she rose to become his favorite. The emperor was so bewitched by her beauty and wiles that he willingly killed a thousand innocent people just for her amusement. The entire set of 9 prints is illustrated in Ikeda Bunko, Kamigata yakusha-e shūsei (Collected Kamigata Actor Prints), vol. 1, Ikeda Bunko Library, Osaka 1997, no. 364. Also illustrated in color in Osaka Prints by Dean J. Schwaab, p 106, #74. There is one other print from this series in the Lyon Collection. See the link above. The publisher Honya Seishichi was known to have printed non-serialized actor prints by Yoshikuni.